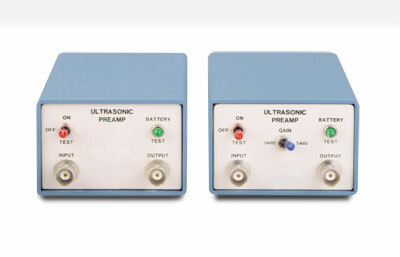 The ultrasonic preamplifier models for use with ultrasonic flaw detection, thickness gaging, and acoustic emission instrumentation provide very low noise amplification of ultrasonic signals. Olympus wideband series of Panametrics AC coupled, broadband preamplifiers provides very low noise amplification of ultrasonic signals ranging from 500 Hz to greater than 40 MHz. Specifically designed for use with ultrasonic flaw detection, thickness gaging, and acoustic emission instrumentation, our preamplifiers are a cost-effective solution in general applications requiring high gain/low-noise amplification of low amplitude ultrasonic signals. Our preamplifiers are ruggedly housed, completely self-contained, simple to operate, battery or AC powered units. They offer performance features such as very low noise (5 µV peak-to-peak noise referred to the input in Model 5660B), input protection for high voltage transients such as transducer excitation pulses, and the ability to drive long coaxial cables (greater than 500 feet or 152 meters with Models 5660B and 5660C). Both fixed gain and switchable gain versions are available, and custom units with special gain or bandwidth are available on special order. Certain ultrasonic applications require the addition of a separate preamplifier unit to standard test systems in order to provide the additional gain or broadband signal-to-noise enhancement necessary for optimum signal acquisition. This is often the case in industrial applications involving flaw detection or thickness gaging of thick sections of materials exhibiting high ultrasonic attenuation such as nodular cast iron, brass, bronze, austenitic steel, rubber, Teflon®, or reinforced composites. A preamplifier is also an important component of acoustic emission test systems that require amplification of low signal amplitude events and the ability to drive long cables from remotely located sensors. Panametrics preamplifiers have also been used in many widely diversified research applications including seismic studies, determination of the size and number versus scattered frequency relationship for acoustic scatterers in water (gas bubbles, zooplankton), crack detection in graphite vacuum arc-melt electrodes, and biological tissue analysis. The Model 5682 Ultrasonic Preamplifier provides low noise amplification of ultrasonic signals ranging from 500 KHz to 25 MHz. The preamplifier, housed in a rugged enclosure, is very small and lightweight making it ideally suited for remote applications. The preamplifier can be powered with either a single 9 V battery for up to 50 hours of continuous operation or a local 9 V to 13 V DC supply (customer supplied). When battery operated, a multicolored LED provides feedback on battery status. This preamplifier is ideal for AUT and TOFD scanning. Inclusions: The unit is supplied with one 9 V alkaline battery. All cables are sold separately and are offered in a variety of lengths and connector styles to accommodate transducer, instrumentation, and applications requirements.